LEO VARADKAR IS examining alternatives to the government’s long-mooted universal health insurance (UHI) model, indicating that the policy championed by his predecessor James Reilly could be ditched. The Health Minister said today that he wanted to “make it happen” but admitted that alternative approaches to providing universal healthcare in Ireland are being examined. Varadkar acknowledged the government’s plans for UHI are behind schedule but said the coalition has done more than its predecessor to provide universal access to healthcare, citing the recent introduction of free GP care for children under 6. His comments follow a story in today’s Irish Times which said the minister had sought new research looking at confining UHI to hospitals and excluding primary care and drug payments. The government published a white paper on UHI last year when Reilly was still the minister. It envisaged eventually scrapping the current two-tier health system in favour of making everyone pay for their care through an insurance scheme funded by private operators and the state-owned VHI. Speaking today, Varadkar said that while he wanted to make UHI happen it was important to consider in the funding of any model as to how money would be collected, how it would be spent and ensuring there is enough to meet demand. “One of the key reforms that really has to happen is activity-based funding so that hospitals are funded based on the work they do, not on block budgets,” he said. Earlier, a spokesperson for the Department of Health said that Varadkar had asked researchers to look at costing “different degrees of cover for UHI” including confining it to hospital-only care and excluding drugs or primary care. “For comparative purposes we have also asked the researchers to look at other models of UHI such as single payer insurance, as well as a model funded fully through taxation using social insurance,” they added. We are also trying to assess the actual cost of meeting unmet demand, because there is no point introducing a new system of health provision unless it satisfies unmet demand. Despite this, the department said that work on UHI is continuing involving the economic think tank the ESRI, the Health Insurance Authority (HIA) and the accountancy firm KPMG. “This is a huge piece of work which has generated the need for further research as the Minister wanted several questions answered and different options explored and compared,” a spokesperson said. Speaking to reporters in Dublin today, Varadkar said that a model he favoured was one that existed in the past for dental treatment where people got some cost of their bills back through PRSI. I’d like to see that restored both for dental treatment and maybe used in primary care as well. Varadkar intends to finalise a roadmap for universal healthcare with the Taoiseach and the special cabinet sub-committee on health by this summer or early in the autumn. But Fianna Fáil health spokesperson Billy Kelleher today called on Varadkar to abandon the UHI plans altogether. He accused the government of having no costed health policy. “It is clear to anyone who has followed his actions since coming into the Department that Leo Varadkar will not be introducing the mandatory health insurance scheme that his party campaigned for ahead of the last election,” he said. Read: How much will Universal Health Insurance cost you? 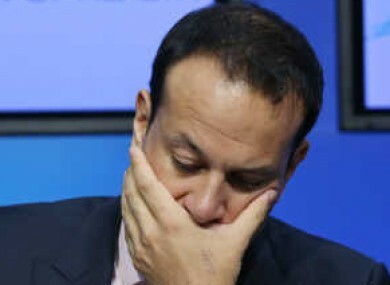 Email “Is Leo ditching universal health insurance altogether? ”. Feedback on “Is Leo ditching universal health insurance altogether? ”.